Commenced by Roger II and consecrated in 1140. The Chapel is inscribed on UNESCO’s World Heritage List. 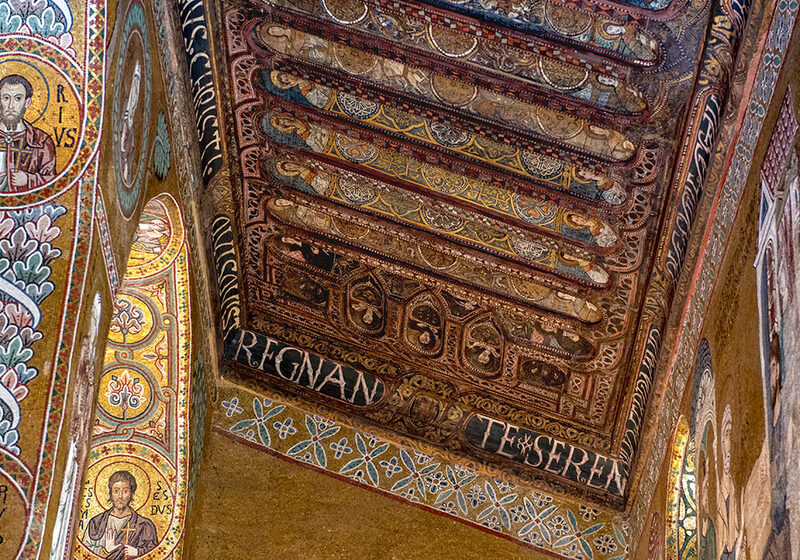 The Palatine Chapel, consecrated on Palm Sunday, 28 April, 1140, is inscribed on UNESCO’s World Heritage List. 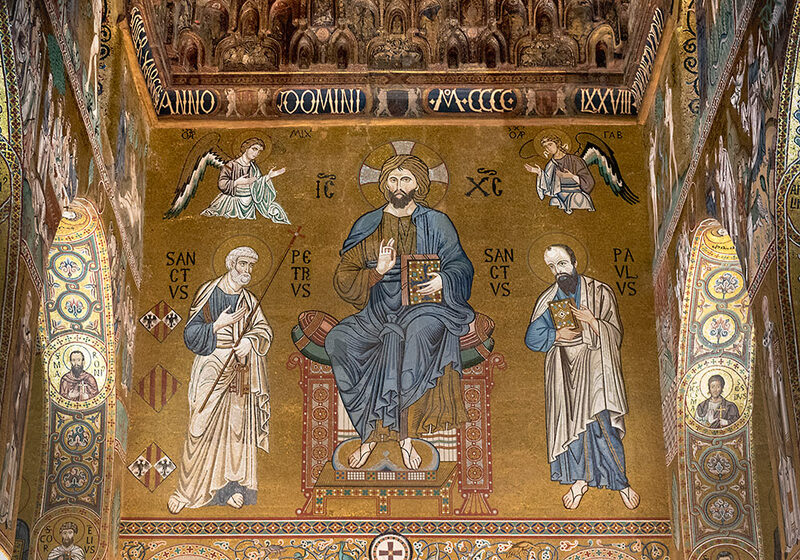 The mosaics in the Palatine Chapel were probably made by the same craftsmen that made the mosaics in the Martorana and the central apse of the Cathedral in Cefalù. The Chapel is part of the architectural complex of the Norman Palace. 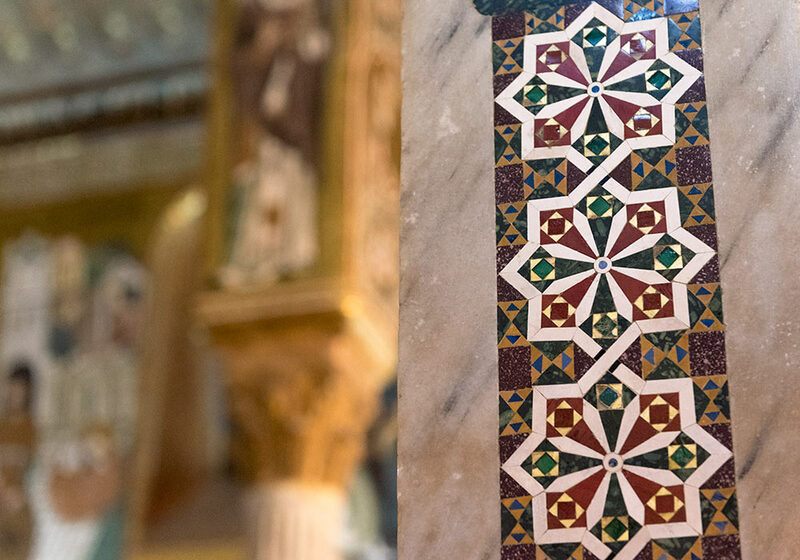 We don't know for certain when the mosaics were made, but the mosaics of the nave and aisles were most likely made during the rule of William I (1154-1166). 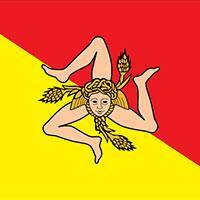 William I (1120 or 1121 – May 7, 1166), called the Bad or the Wicked (Sicilian: Gugghiermu lu Malu), was the second King of Sicily, ruling from his father's death in 1154 to his own in 1166. He was the fourth son of Roger II and Elvira of Castile. 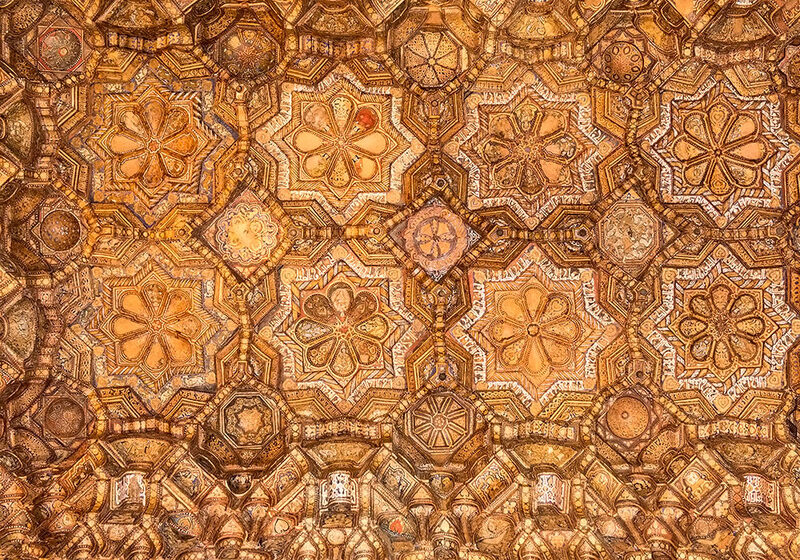 The wooden ceiling of star-shaped panels, carved and painted by 12th century craftsmen from Maghreb. Star shaped panel with 8 points, framed with strips in Kufic script. Inside are petals with figures. 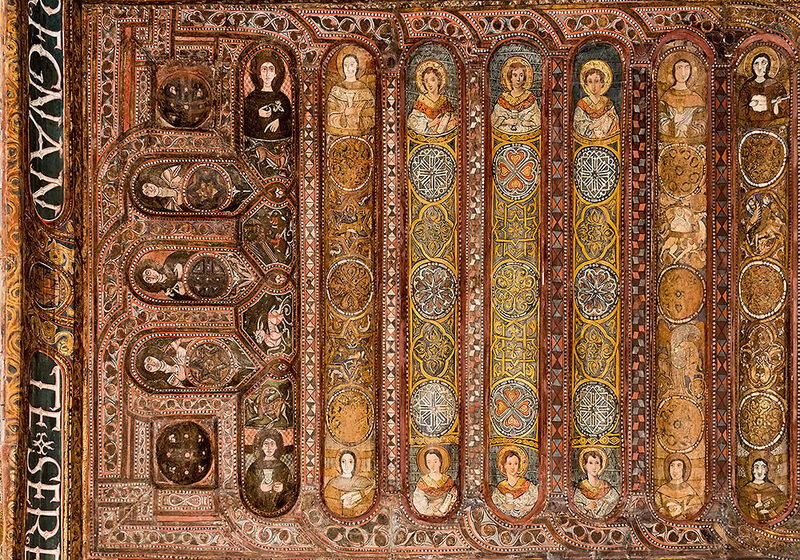 The magnificent wooden ceiling. Nave, north side. The Chapel is dedicated to St. Peter. 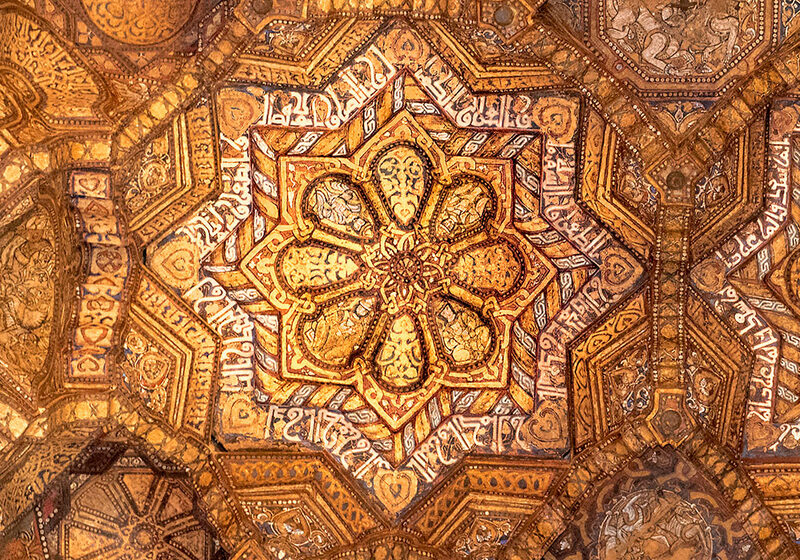 12th century mosaic on the western wall of the nave. 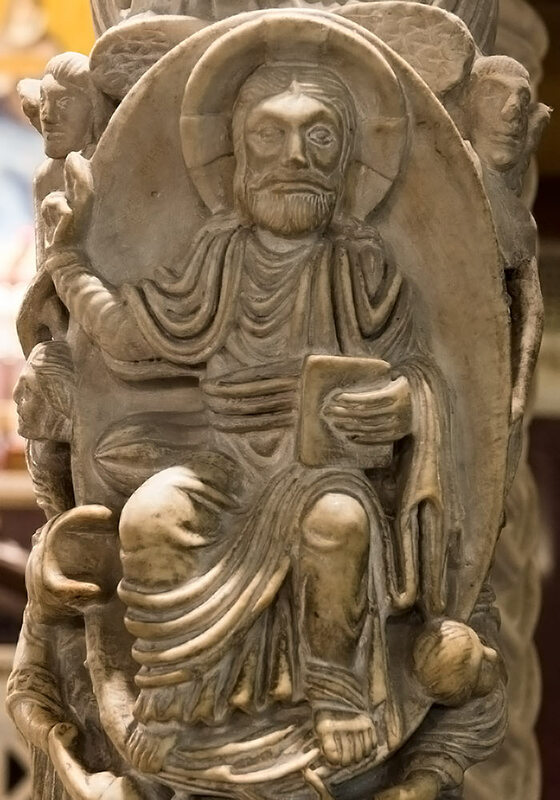 Christ the Lawgiver seated on a lavishly decorated throne. To his left St. Peter; to his right St. Paul. Above are the Archangels Michael and Gabriel. 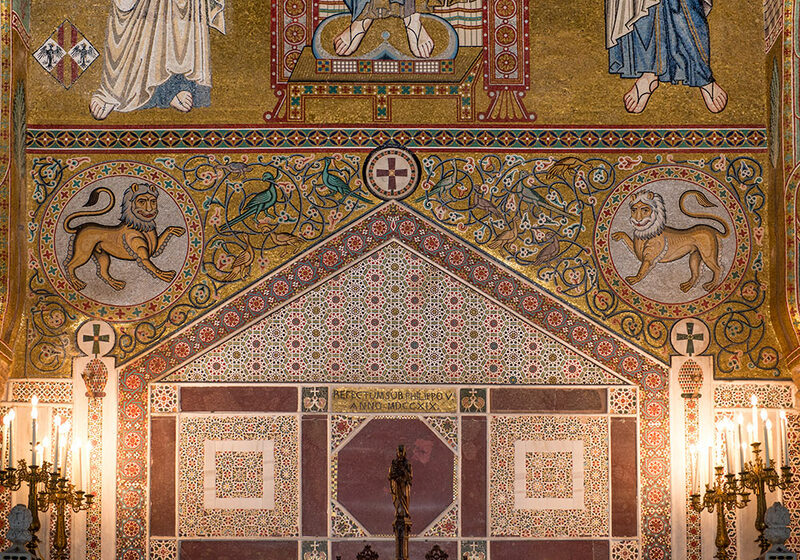 The mosaics in the Palatine Chapel and the Church of the Martorana were probably made by the same craftsmen. 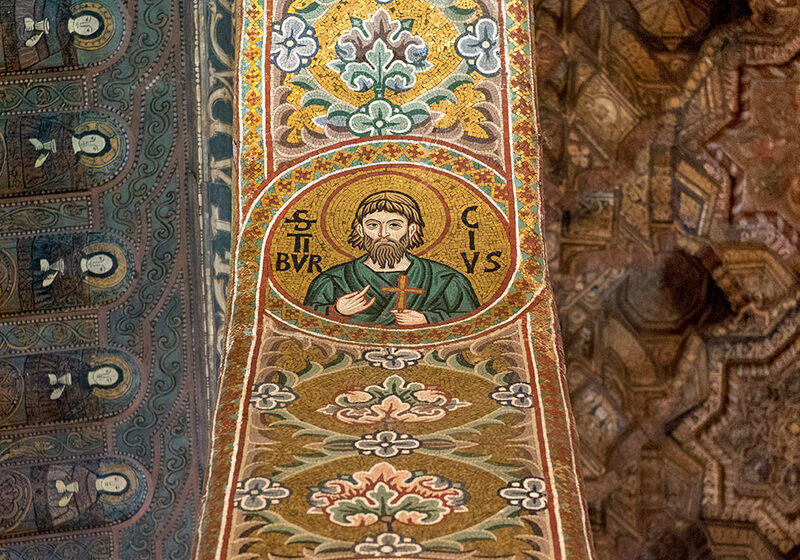 Saint Tiburtius (Tibvrcivs), a Christian legend beheaded c. 286. 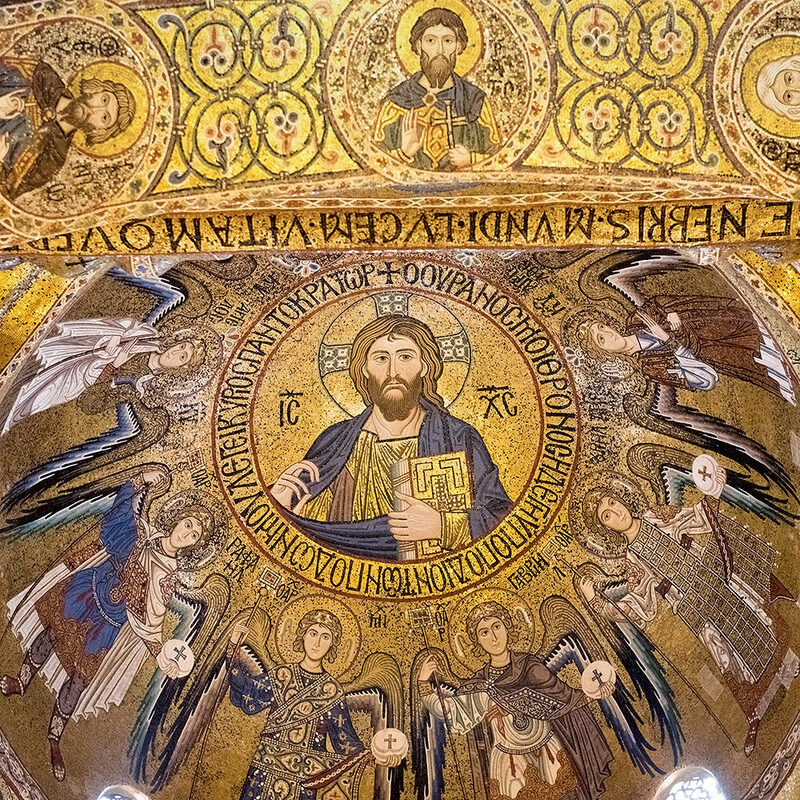 The Byzantine mosaics has roots back to the first centuries of the Eastern Roman Empire. 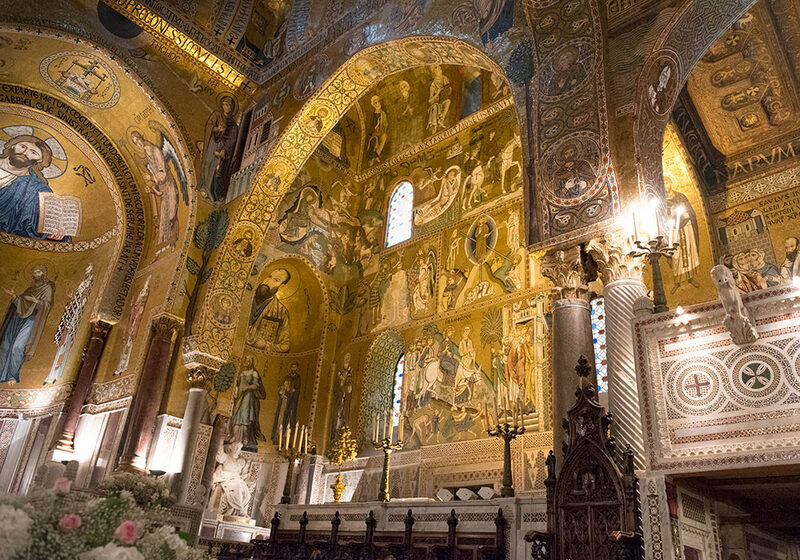 The best examples are to be found in Ravenna, Venice (St Mark's Basilica), Istanbul (Hagia Sophia), Monreale Cathedral, Cefalù Cathedral, Palermo (Church of the Martorana, Palatine Chapel). Man being eaten by a lion. 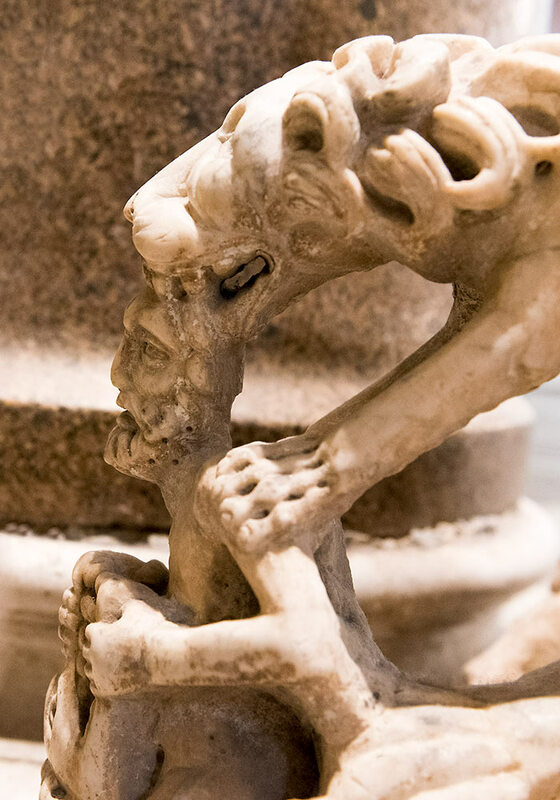 Detail of the Paschal Candelabrum ascribed to the Master of the putti, who also carved the capitals of the cloister in Monreale. 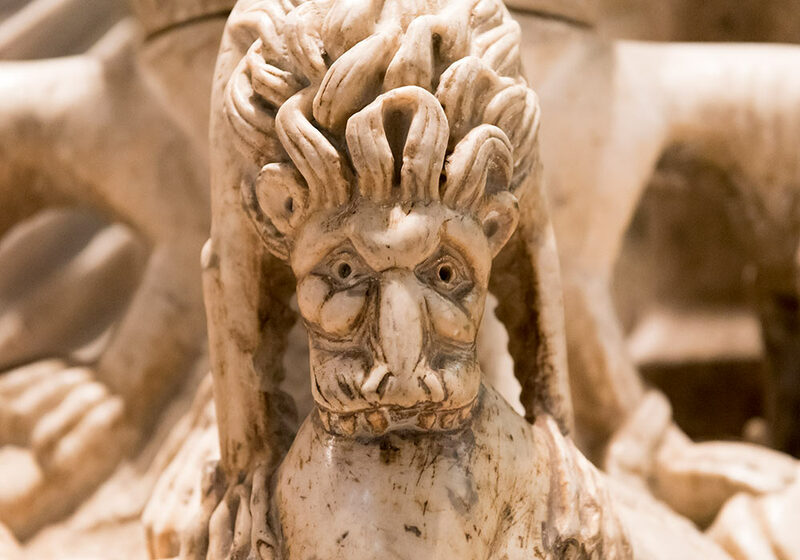 A sculptural detail of the Paschal Candelabrum. 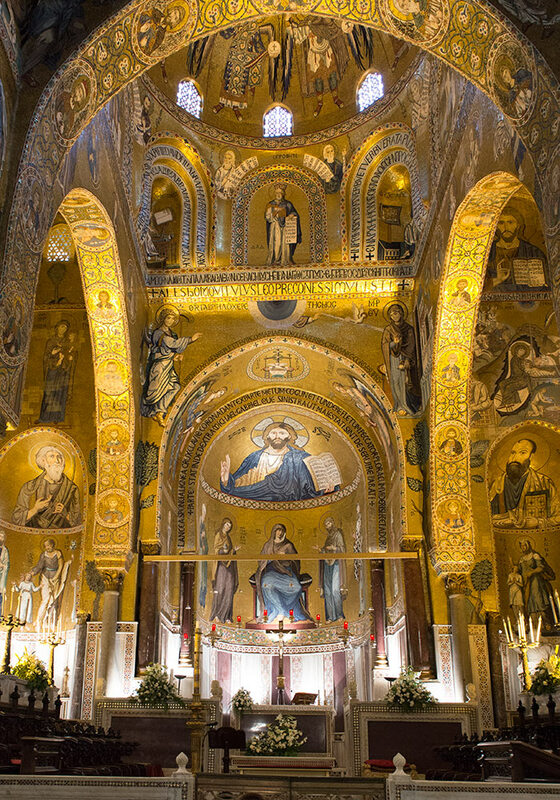 The Palatine Chapel is the royal chapel of the Norman kings of Kingdom of Sicily situated on the first floor at the center of the Norman Palace in Palermo. The chapel is a great symbol of multi-cultural cooperation. 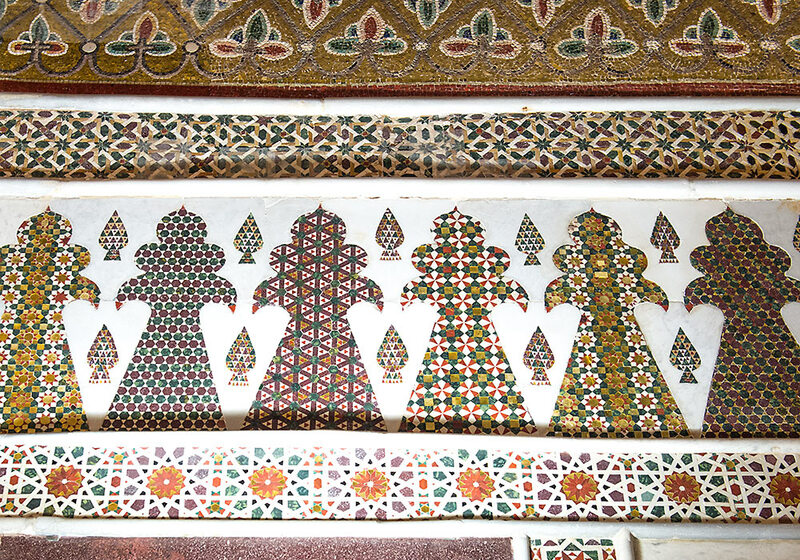 Craftsmen of three different religious traditions worked alongside each other. The madonna below Christ Pantocrator is an addition from the 18th century. Originally there was a window there. Originally there were 50 windows (later blocked) designed to illuminate at all times of the day the stories told on the wall. 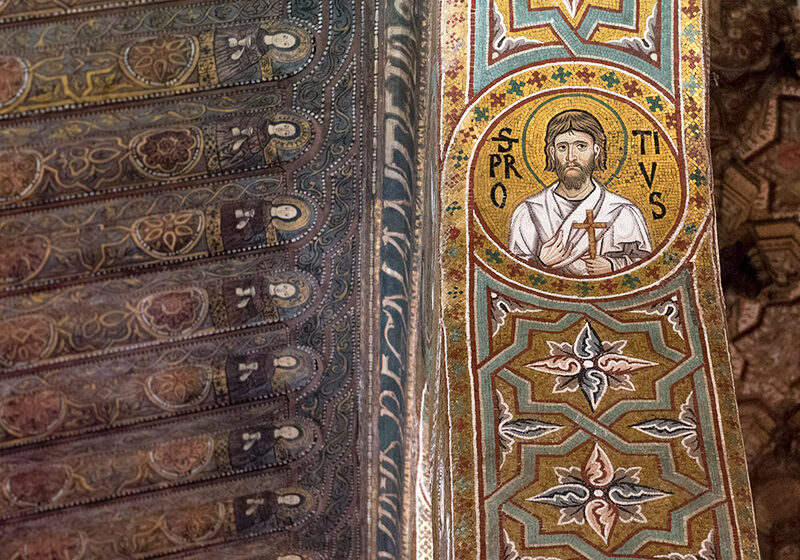 The texts in the chapel are written in Greek, Arabic and Latin. After Norwich's book was written, the "distressingly baroque" elements have been removed. 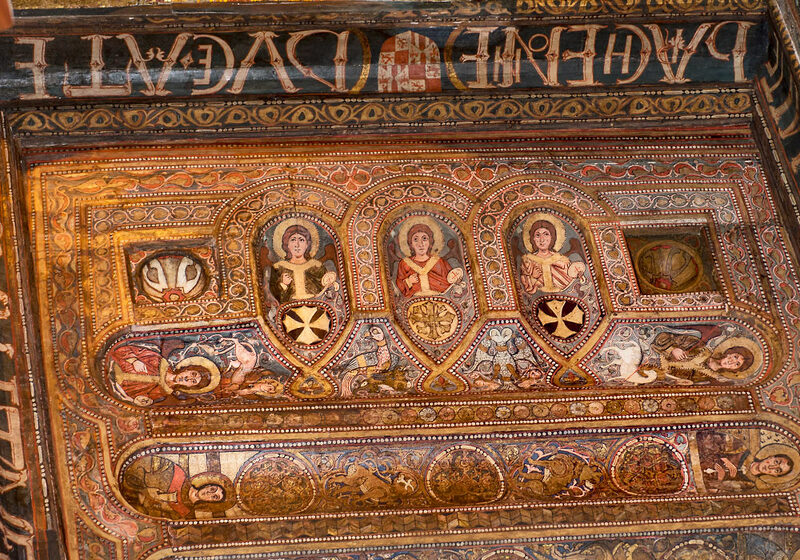 Detail of the spactacular Paschal Candelabrum in Cappella Palatina. 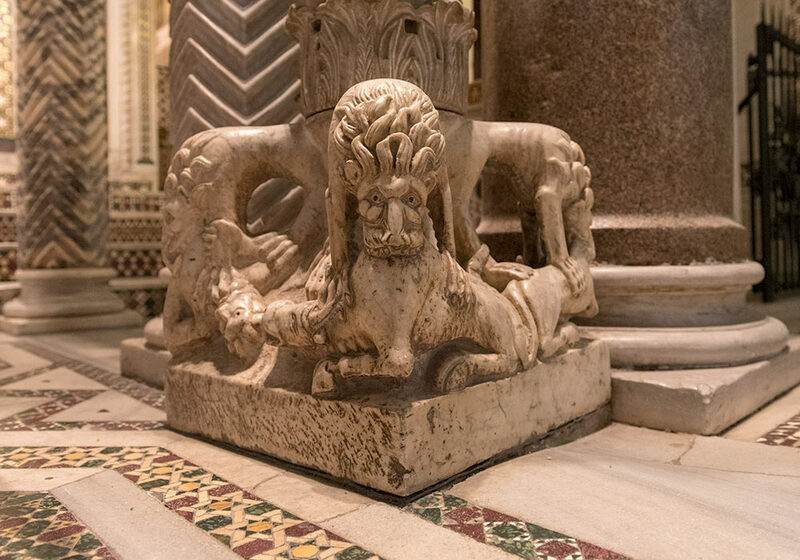 The Paschal Candelabrum was carved by the "Master of the putti", who also made the capitals of the cloister in Monreale), according to Rodo Santoro. 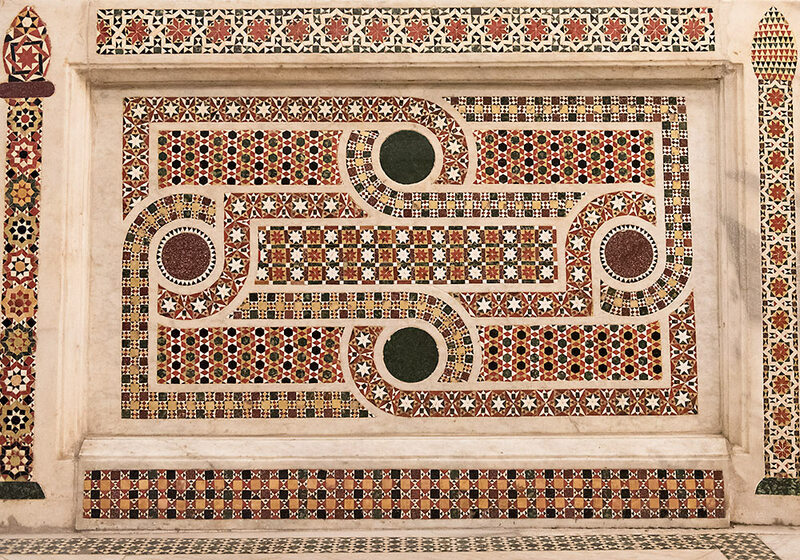 The Palatine Chapel: Detail of the wall. 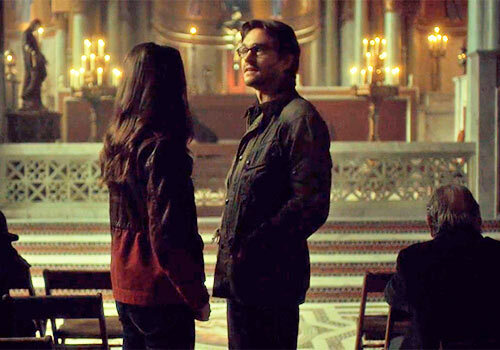 Cappella Palatina was used in an episode of the TV series Hannibal (an American psychological thriller–horror television). 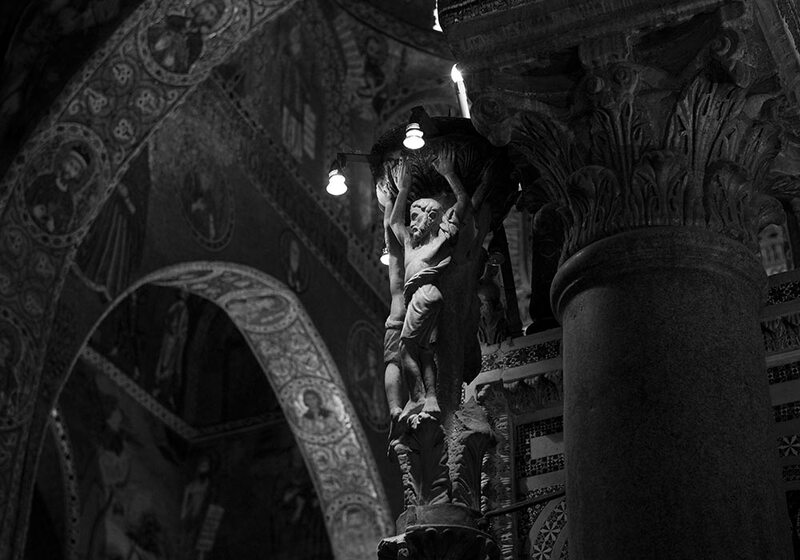 Rodo Santoro: The Palatine Chapel and Royal Palace (Palermo, 2013).